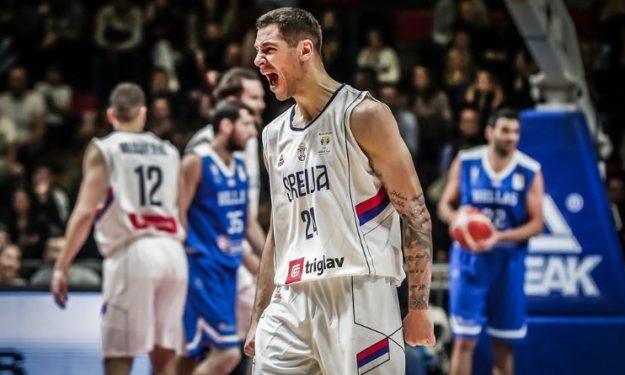 Stefan Jovic led Serbia to a convincing win against Greece and put them in a good position to clinch a World Cup spot. Stefan Jovic banked 22 points as he led Serbia to a fairly easy 84-61 win against Greece on Gameday 10 of FIBA Wolrd Cup Qualifiers. Vasilije Micic and Miroslav Raduljica helped him with 13 points each while on the other side, Christos Saloustros and Lefteris Bochoridis scored each 12. This was the first loss for Greece (9-1) in the qualifiers but they have already clinched a spot for the 2019 World Cup along with six other teams so far (Germany, France, Czech Republic, Lithuania, Spain, Turkey). As far as Serbia goes, they currently hold the third place in Group L with 6-4 and a win against Estonia in the next game would secure them a spot in China.